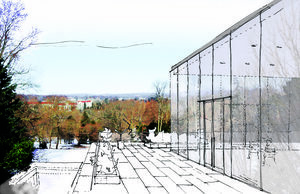 Located outside Philadelphia in Chestnut Hill, Pennsylvania, this 175-year-old institution dedicated to preserving the creative legacy of local artists seeks to dramatically expand its 6-acre site. Site interventions include a master plan dedicated to opening the institution and its grounds to the broader community, as well as the modernization of its main building for the display of a larger portion of its collection. Strategic “excavations” through various piecemeal additions that were added to the main building over its long history will reveal its original structure and materiality. The historic building will be opened up, both literally and figuratively, to accept new contemporary gallery spaces.